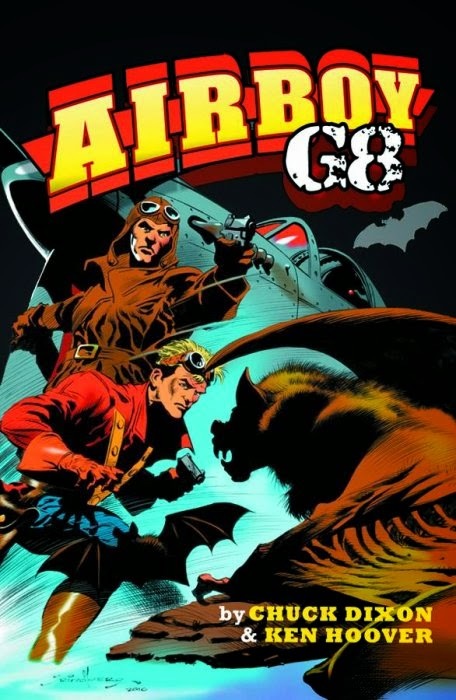 This graphic novel from Moonstone Books, set in December 1940, has Robert J. Hogan's pulp aviator G-8 (a Wold Newton Family member according to Farmer) teaming up with Hillman Comics' costumed aviator Airboy (who also has already been established as existing in the CU) to battle a new batch of mutant bats created by G-8's archenemy, Herr Doktor Krueger. It's worth noting that the writer of this comic, Chuck Dixon, wrote a story for the anthology The Captain Midnight Chronicles that has Airboy teaming up with Captain Midnight near the end of World War II. This encounter is treated as their first meeting, which might conflict with Jim Harmon's theory (referenced by Win in Volume 1) that Captain Midnight and G-8 were the same person. On the other hand, perhaps Dixon was providing misinformation for reasons of his own. Also worth noting is that Krueger is in very poor health in Airboy/G-8, confined to an iron lung. However, he must have made a partial recovery within two years of the story, as he is merely wheelchair-bound when he appears as "Herr Doktor K" in Tom Johnson's story "The Nazi Spider Staffel," set in August 1942.